This new modern business centre has contemporary office space available in an ideal professional environment. We also offer parking and other services. The space is modern, stylish and affordable. Three ground floor offices of 343 sq ft, 184 sq ft and 161 sq ft are available. On the first floor, four 166 sq ft offices, one of 244 sq ft and another of 507 sq ft are available too. The centre is located close to the town centre and access to the M3 and within walking distance of Alton train station. 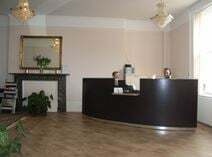 A spacious office provided with waiting room is available to let in the centre of Alton, within walking distance of the most renowned streets of the city, markets, shops and the railway station. This office is provided with air-conditioning, telephone, desk, cleaning service and everything you need to run an office. It is available at flexible rental terms and at a very convenient price. A business centre, in scenic surroundings, which prides itself on the level of service provided by its on-site team. A wide range of accommodation sizes is available. The premises have a car park, and are CCTV monitored. Situated on the edge of Alton town, close to the train station which provides a direct service into London. The M3, via the A31, is a short drive away.